Who would have guessed that spending six hours standing in the sun could be so much fun? 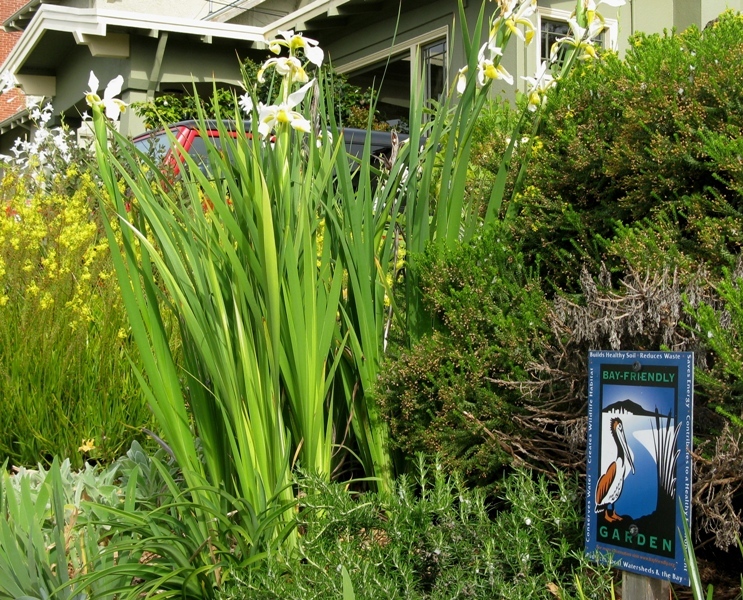 Yesterday, my yard was on the Bay Friendly Garden Tour. With help from greeters Fred, Gina and Holly (a big thank you to my fellow Master Gardener trainees!) we hosted over 450 visitors. From 10 am to 4 pm, I was in my backyard talking to people about growing food. I was also listening to them and their ideas, learning about things like organicponicos in Cuba, how to train my young grapes to provide a visual screen from the neighbors yard and how to protect my deck where I’m installing a new planter. Even though I’m mostly between winter and summer annual crops right now, people were very interested in my perennial vegetables, fruit trees and berries. My favorite visitors of the day were the three well-behaved toddlers who found my snap pea bush sprawling out over my mulched walkway, all of whom were willing to sample a little bit of fresh garden produce. The Bay Friendly Garden Tour is sponsored by Stopwaste.org, the same organization that sponsors the Master Composter training program in which I participated a few years ago, and the same organization from which I purchased my discount compost bins. I went on the tour several years back and it was an eye opener for me, teaching me about the powerful aesthetic and psychological effects landscape design can potentially provide. This year I volunteered my yard to be on the BFG Tour. It was delightful, meeting and talking with many of these people and sharing gardening information. Gardeners have to be some of the nicest people on the planet. Read on for a few more details about my yard and what people were interested in. 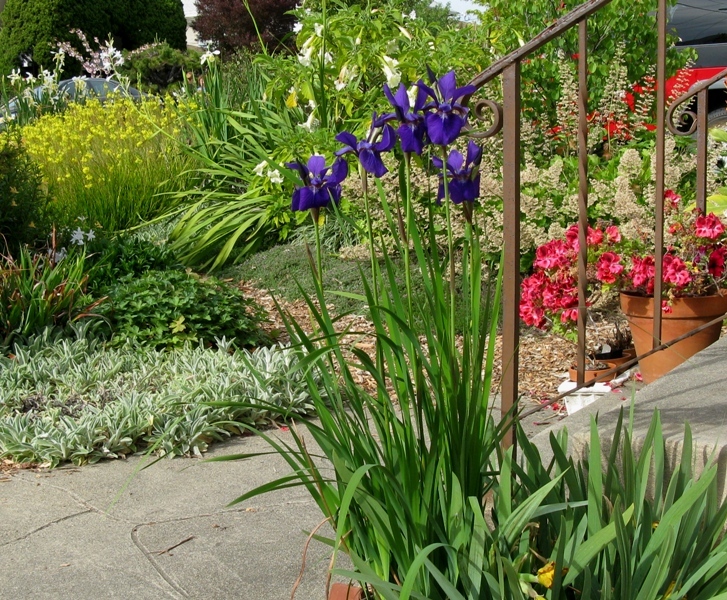 My front yard was planted three and a half years ago and has now grown up to be a mature drought-tolerant landscape. With the spring rains continuing to come within a week of the tour, the yard was lush with color. 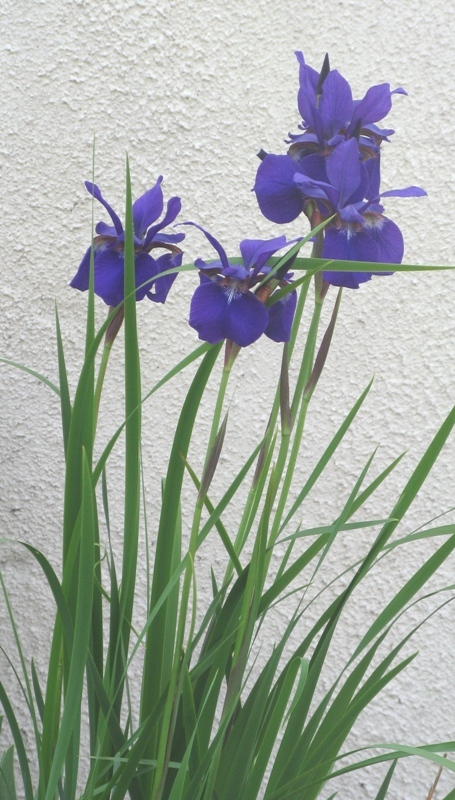 This early in the season some of my favorites still haven’t blossomed yet, but many early bloomers were in their prime, including most of my irises. I wish I could have been in two places at once, because it would have been fun to talk with people in my front yard. 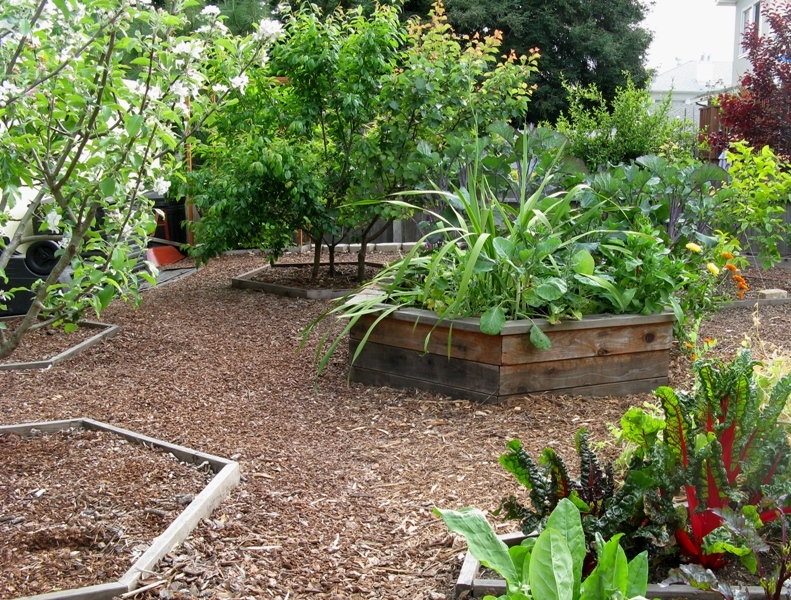 But, I spent the entire day in my backyard, talking with people about my passion for growing food. People asked a variety of questions about my fruit trees and I was able to explain to them some of the basics of backyard orchards and how cultural practices differ from commercial orchards. I have a variety of trees at different stages of growth, from an apple planted about five years ago to an Aprium and persimmon still being trained. With both stages to demonstrate, people could easily see how to prune fruit trees to a small fruit-bush size. 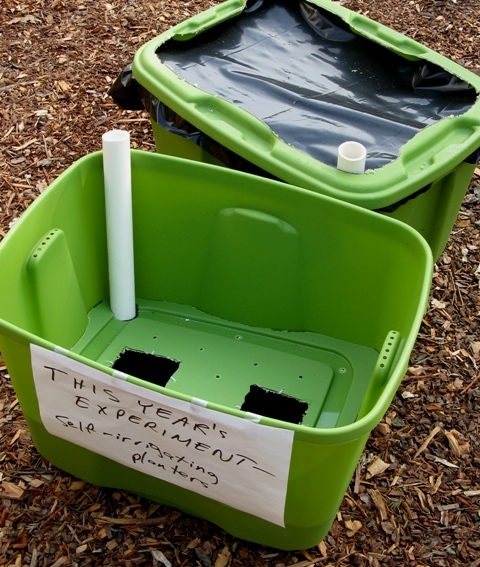 Many people were interested in composting and I was able to show them my ‘regular’ compost bins as well as my worm-composting bin. By far, however, I received the most questions about my black raspberry. 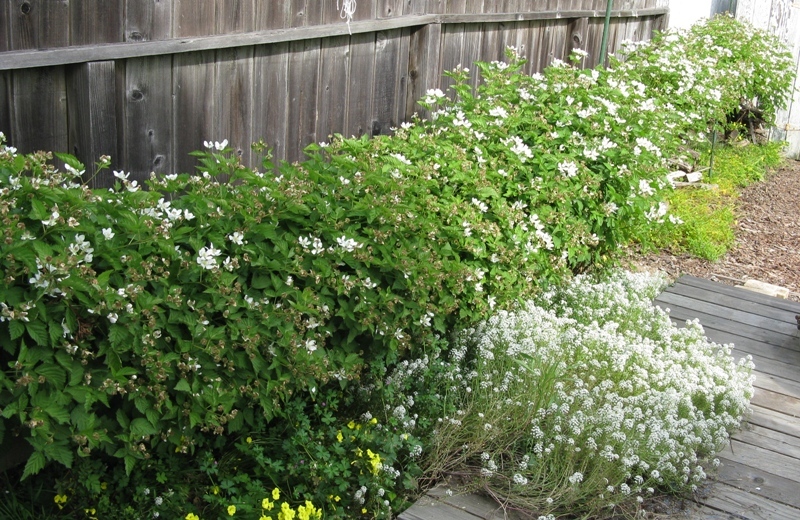 It was giving a fine display, with 35 feet of canes that grew out last year, now covered with white flowers being pollinated by honey bees. I have it trellised out along my fence and it made a perfect prop to explain its two year production cycle and how I alternate between high and low wires each year. In second place were the questions I received about the self-irrigating planters I had on display. People were very curious to know how they worked. All in all, this was a great day, topped off with a cold beer afterwards with Holly as we tallied up the visitor totals, then showed a late-comer around the yard. can you post some pictures of the things growing in these boxes later on ?? and may be comments on how they are working ?? Thanks, Izzie. Good idea. But, first, I have to get some soil and get things planted! I was on the Bayarea friendly garden tour last year and was vowed by your blackraspberry vine. You mentioned that you were starting some…..just wondering whether you have any at this time. I would be happy to either barter ( some of my plants) or buy one from you. Can you please let me know, as I have the perfect spot for a vine. Thank you in advance. Good timing. A couple of the canes have put out roots, so I can just give you a cutting from one or two of those. I’ll send you more info via email.